In Color Order: Sparkle Quilt Along - Finish and Linky Party! Sparkle Quilt Along - Finish and Linky Party! This post is part of the Sparkle Quilt Along. For more information see here. 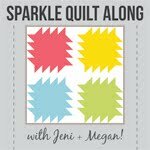 Welcome to the final week of the Sparkle Quilt Along, hosted by Megan of Canoe Ridge Creations and myself! Today I'm going to share my finished mini quilt and give you a chance to link up your finished quilts! Sparkle Quilt Along: Finished!, a photo by jenib320 on Flickr. When I was choosing fabrics for my mini quilt, I worked backwards, choosing the binding fabric first and then from there chose the sparkle fabrics. It can be hard to choose binding that coordinates with all your prints, so why not try choosing it first! I think it worked out really well! Sparkles: A Day in the Life by Mummysam, The Woodlands by Khristian A Howell, Castle Peeps by Lizzy House, Tailor Made by Cosmo Cricket. Background: Kona White. Binding: Follow your Imagination by Prince Charming. For backing I was originally going to use the same fabric as the binding, but I didn't end up having quite enough. So I mimicked the stripey binding fabric by using strips of coordinating solids from my stash. I actually quite like how it turned out! I quilted my mini quilt with my signature doodle loops. I just can't get away from them! They're second nature for me, and so quick! Plus they're sort of whimsical, which definitely went with the fabrics I used! Thank you for quilting along with us, it was a lot of fun! Please continue to add your photos to the Sparkle Quilt Along Flickr Group, we love seeing your progress! I love how you took four very different fabric pieces and really made them work in this quilt - I would never have put those all together! very nice, jeni! i love how your fabrics create such a fun place for the eye to rest. and the backing....wow! I love your color blocking for the backing of this quilt - and the colors are delicious! Very, very cute. Love that you picked the binding first. And really love your back! Thanks for a fun QAL! Jeni, your quilt looks wonderful. I love the stripedy binding! I'm stalled out on my sparkle, waiting for batting to come in the mail. But I see that the linky goes for a number of weeks so I still have time! Your colors are so fun Jeni! I love the way your back looks too. Thanks for the quilt along! Very cute. I didn't participate in this but I like seeing what everyone else did.